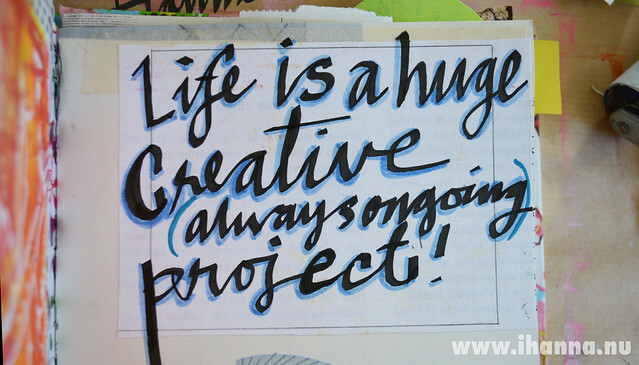 Life is a huge (always ongoing) creative project. 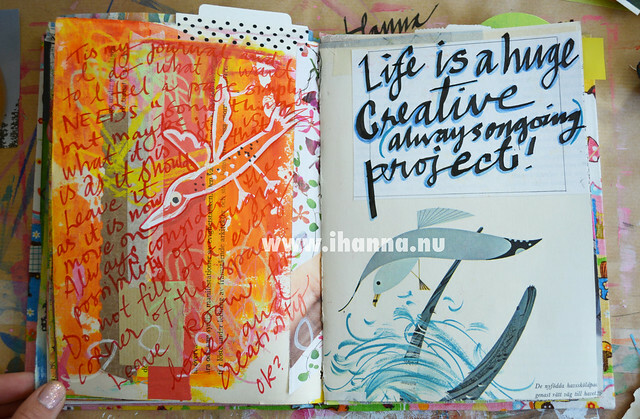 Depending on my mood, this iHanna-quote that I wrote as big as I could in my Art Journal, rings either positive or negative… What’s your take on the statement that life is a huge and always ongoing creative project? Is it awesome to always have your hands full – or is it tragic to be in the middle of a never ending story of creative ideas? I don’t mean that life won’t end, I’m sure that will happen way too soon for most of us, I just mean that it’s always a desk to clean, a journal to fill, materials not used in way too long – stuff that is now giving you a bad conscience for not using them enough… Is the creative life easy-breezy and always fun? My answer: no, it’s complicated. The creative life is wonderful in many ways, but I sometimes wish I could turn my brain to stand bye, and let the light blink blink blink in the darkness, without having to listen to the motor going all the time, then the fan, then the motor… or having to deal with the automatic output that distorts my living space over and over again. Maybe I’d be calmer if I had more space, or a way to close the door on what’s going on around me? I hadn’t planned to rant today, but there you go. Thoughts pop up and become texts sometimes, and that is a good thing, especially considering my June goal. I’d love to hear your thoughts on this thing called creativity, so please share in the comments, and have a beautiful day! 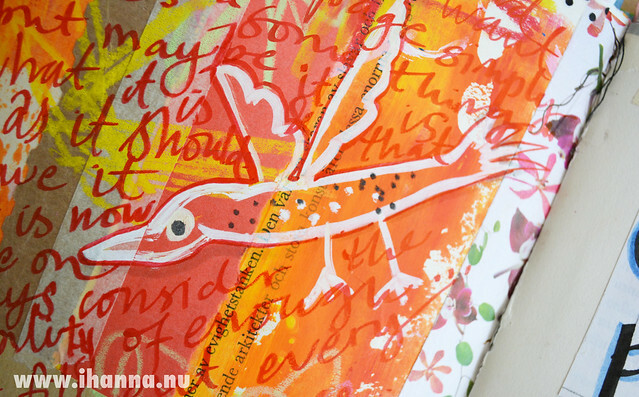 This entry was posted in Art journaling, My Philosophy and tagged art journal peek, drawing, quote. Bookmark the permalink. I’ve thought so much about this over the last year as I wrote my book. There’s a lot of talk about slaying creative demons, and that idea was central to what I wanted to write about, but I became more and more uncomfortable with it the more I wrote and thought. Because our creative demons never disappear entirely, no matter how hard we fight. Right? There’s always another complication ahead. Or another fear. Or struggle. And that’s not a bad thing, it’s just a human thing. Figuring out how to convey that in a book that I want to be a positive experience for people was hard! But I think I may have done it. Or at least I’ve done it a little. If I hadn’t been able to, I don’t think id be able to be proud of what I did. Anyway, obviously I agree with you entirely! We may wish it were all simple, but I find it easier and more enjoyable to just accept that it’s complicated. I pity the poor souls who don’t have creativity in their lives as I spent too many years in that space. I will take the distractions of one creative pursuit calling to me while in the middle of another. Life is messy I’ve come to accept. As long as it includes yarn & crochet needles, endless journals to be filled, lots of color, paints, pens etc and talented artists like you who share their experiences. ..I’ll take it. PS I received my last post card today! Woo hoo! I look forward to the fall #DIYPostcardSwap. I think about this a lot, too. Whatever new idea pops into my head is usually the “BEST IDEA EVER!” and it gets exhausting chasing after this stuff all the time, while still trying to complete the last best idea ever, and so on…It finally dawned on me a few years ago that I will simply never be able to get around to creating all the decent ideas I come up with. There are simply too many of them! It was, frankly, kind of a depressing revelation. However, this has taught me to be much pickier with the ideas I do give my time to, and I hope it will lead to better, stronger creative work. Silver lining? 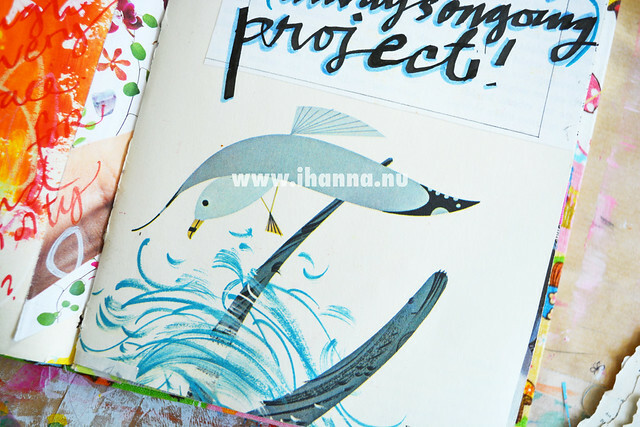 Hanna, I pity people that have no creative urges. I think there is a part of life that is empty for them. Whatever the disadvantages are for someone like you, I think the opposite would be infinitely worse.